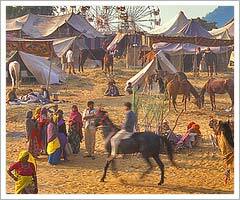 Pushkar fair is well-known for its Camel trading and other attractive activities. Cattle auction and camel races are also a part of the festivities. Pushkar festival is not about camels only but it is also about horses, cows, goats and sheep and most importantly about the lively people of Rajasthan, who come to the Pushkar fair in their best attires. The festival looks like a riot of colors with men wearing colourful turbans and women in pleated ghagaras (ankle-length skirts) of different hues. The festival offers a wonderful opportunity to see the people selling and buying camels, goats, horses etc. Bargaining, negotiations and transactions remain order of the days during the festival. Pushkar is a religious town and is one of the important pilgrimage centers of Hindus. Pushkar is known for the holy Pushkar Lake and the many temples that dot the area. Puskar is associated with Lord Brahma and is the only place in India, which has a temple dedicated to Lord Brahma. It is believed that whoever takes a dip in the holy Pushkar Lake on Karthik Purnima day is absolved of all their sins. Pushkar is located in north-west of Ajmer and it is well connected by road with Jaipur and Delhi. In the evening as dusk descends on Pushkar, thousands of butter lamps are lighted atop delicate leaf boats, which are released in the serene water of Lake Pushkar. The sight of thousands of flickering butter lamps makes a truly eternal sight. This fair is the world’s most fascinating desert festivals.